Satisfy all your ice cream needs this summer with the endless amount of trendy and delicious parlours home to Toronto. There’s nothing quite like the refreshing taste of ice cream in the sweltering heat of a Toronto summer. From the most Insta-worthy concoctions to never-before-seen flavours, Toronto is home to a number of magnificent ice cream spots that are perfect for satisfying all your cravings all summer long. Here are 10 of the must-visit ice cream shops that are totally worth the wait. Nitrogen-powered ice cream? Yes, you read that right. Not only does the liquid nitrogen make for an amazing eye-popping presentation as the creamy mixture turns into ice cream before your eyes, but it is also made fresh with every order. Although it’s never stored in a freezer, the cold result is still the perfect refreshing summertime treat. Family-owned and operated for almost three decades, Booyah opened its first storefront located in 2015. The centrally-located shop has quickly become a favourite spot for its diverse menu of delicious treats, especially their ever-popular ice cream tacos. With dozens of ice creams from Kawartha itself, the freshly baked waffle cones and cookies are the perfect complement. Conveniently located next to Trinity Bellwoods, it’s no wonder Bang Bang oftens has a queue that stretches out the door and onto the street. With some of the best ice cream cookie sandwiches and waffles that Toronto has to offer, Bang Bang is well worth the wait. 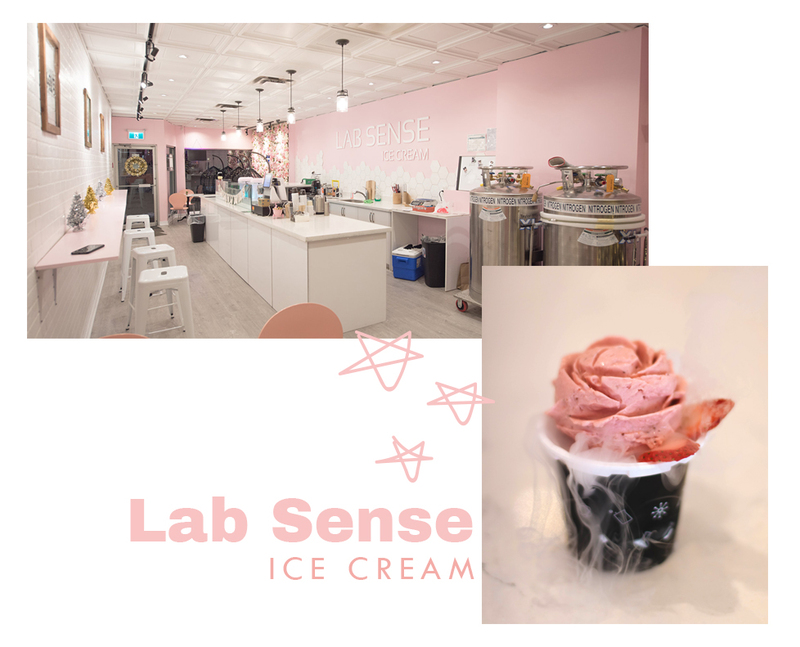 Not only are you able to mix and match with the tasty cones and baked goods, but Bang Bang is home to a number of uncommon ice cream flavours such as London Fog Earl Grey, Peanut Butter and Jelly, Sour Soup and Espresso Totaro. Good luck deciding which one to try first. 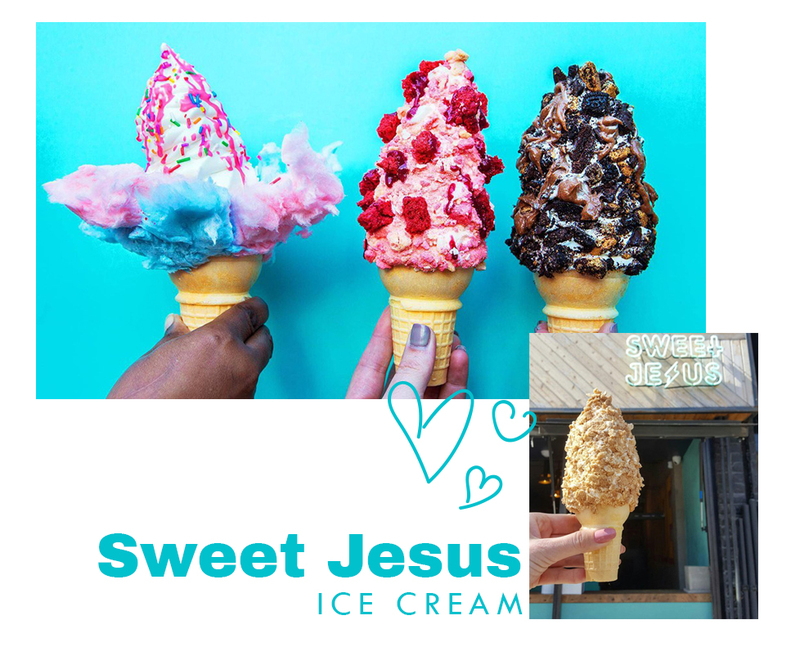 Combining high-quality ingredients with an effort to create an ice cream that looks as unique as it tastes, it’s no wonder Sweet Jesus has become the cream of the crop for many Torontonians. Squished into a corner between Union Juice and La Carnita, Sweet Jesus is easy to miss at first, but the final product is not. Whether you opt for your ice cream plain or dipped, the extraordinary toppings always seem to lead to a frenzy of Instagram activity. 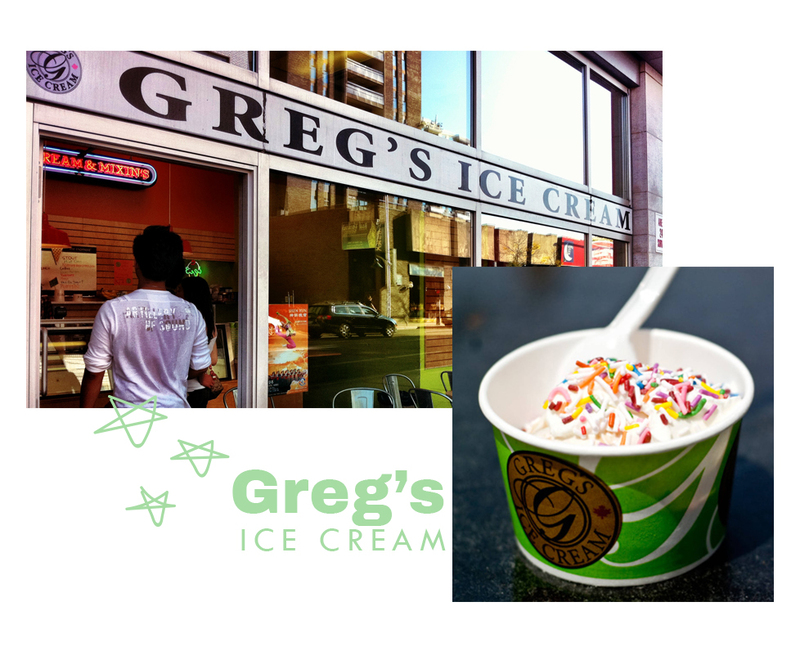 A traditional hangout spot for Ryerson and University of Toronto students, Greg’s Ice Cream has carved out its own special place in the Toronto community. Greg’s offers over 100 flavours of ice cream (at least a third of them have the word chocolate in them), including sweet cream, coffee toffee and the most popular – burnt marshmallow. Once you’ve ordered, take to the outdoor patio to really enjoy your cold treat and people-watch the passing faces of Spadina. Did somebody say doughnuts and ice cream? Yes, Eva’s Original Chimneys combines two classic desserts with their one-of-a-kind doughnut cones. Their speciality Chimneys are a delicious and unique bread-like Hungarian pastry, crunchy on the outside but fluffy and doughy on the inside. Freshly baked and hand-rolled to every order, Eva’s is as much a visual experience as it is a tasteful one. Named after chef Kaya Ogruce’s favourite book and film, this gelato parlour has become known for many sateen-textured experimental flavours, including baba ganoush, roasted parsnip and pad thai. If that’s not quite what you had in mind, don’t fret! Ogruce enjoys including as many local and in-season ingredients as possible, and flavours such as orange carrot, safflower and ginger are surprisingly refreshing. Although it was born in Oshawa, Hollywood Cone certainly lives up to its larger-than-life name. From the red carpet decor to the aptly-named desserts such as the Reese Where’smyspoon banana split or the $77 “Best Picture” milkshake, the Hollywood Cone experience encompasses all the glitz and glamour of show biz. Catching on like wildfire last summer was charcoal ice cream. 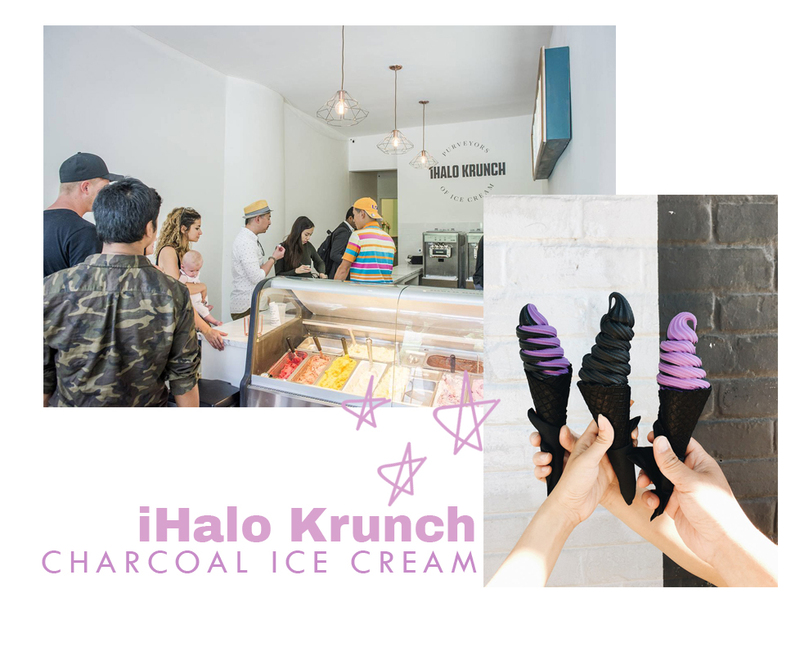 Located in one of Toronto’s sunniest places in Trinity Bellwoods, iHalo Krunch has become one of the most popular spots for its aesthetically pleasing black-on-black ice cream. 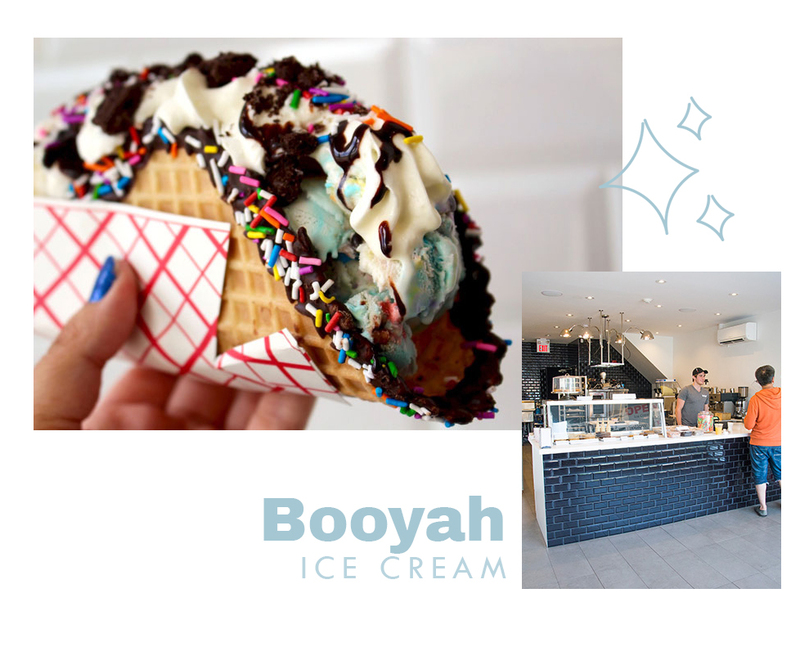 Inspired by Filipino and Asian culture, soft-serve flavours like coconut charcoal, ube and matcha bean are pitted against waffle cones made with activated charcoal that are baked in-house. Dutch Dreams has been a staple of Toronto’s ice cream scene for decades, famous among tourists and locals alike for its wide selection of flavours, decorated cones and imported treats. From the classic sundaes and milkshakes to the quirky figurines and knick-knacks on the interior, everything about Dutch Dreams is cozy and delightful.